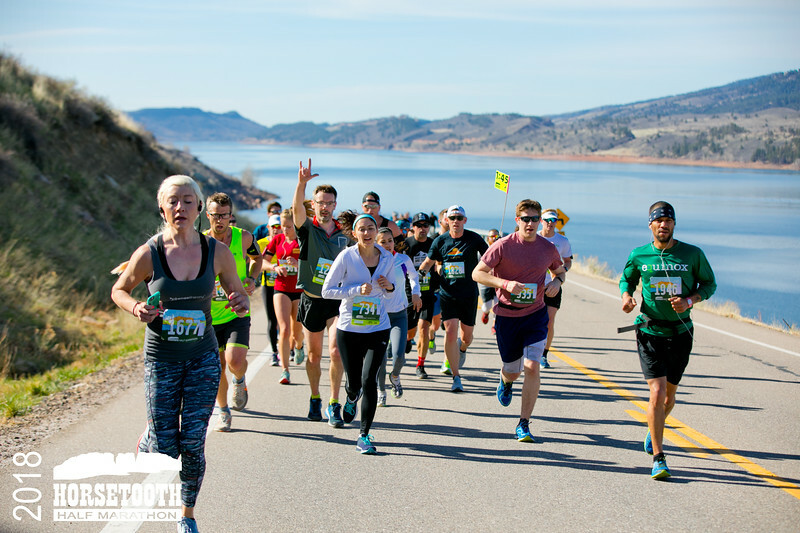 It was a record year for the 46th running of the Horsetooth Half Marathon, with a total of 1,701 runners from 39 different states crossing the finish line. A new record was set by Kenya’s Ivy Kibet in the women’s race, while fellow countryman Dominic Korir came within six seconds of the men’s course record. The fast times were aided by the perfect running conditions we were blessed with this year. Race morning temperatures ranged from the high 30s to low 50s and gave way to beautiful post-race conditions which ended up being perfect for hanging out and enjoying the New Belgium Finish Line Party. In celebration of the beautiful hills that define our state and the course, we annually crown a King and Queen of the Mountain at the course high point just 1.7 miles into the race. It’s not often that the first man and woman to the top of the hill end up winning the race, but that was the case this year with Korir topping out in 10:11 (16 seconds off the hill climb record) and Kibet posting a new women’s record of 11:27 more than a minute ahead of Grace Kahura who was second over the hill. Full results with Monster Mountain and 8 mile split times are available here. Images from our five photographers here. Ivy Kibet wins and sets a new course record. From the top of the hill, Kibet was in complete control and the only question remaining was how quickly she would cover the remaining ground and how many elite men she could leave in her wake. And, by the time she hit Linden St, it was apparent that Brianne Nelson’s impressive 2016 record (1:16:44) was about to go down. 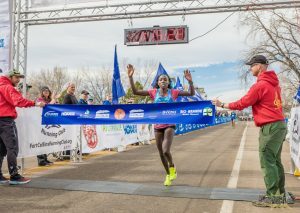 The new women’s mark now stands at 1:15:30, a time that was almost eight minutes quicker than second place Grace Kahura (1:23:10) who ran with last year’s champion AnnMarie Kirkpatrick (1:24:01) before pulling away on the Poudre Trail to secure second. AnnMarie would come in a minute later to secure the final podium spot. The men’s race was a closer-run affair. An early lead pack of five through the early hills was whittled down to three on the way to Bingham Hill. Reports from the lead bike were indicating that Korir was gapping Fort Collins’ Grant Fischer and Boulder’s Kurt Roeser on the uphills but being caught on the descents. On the final climb over Bingham Hill though, Korir made his move on Roeser and Fischer, putting close to 20 seconds on them by the time they hit the Lions Park aid station at mile 8.5. 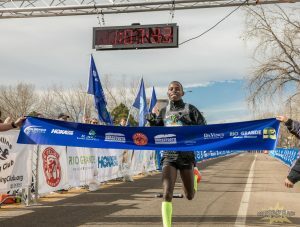 Averaging exactly 5:00 pace over the final five miles, Korir would go on to win the race by just over 40 seconds in a time of 1:07:33. A late charging Hillary Chesire would catch Fischer and finally Roeser in the final miles of the race, posting a time of 1:08:11 for second just 14 seconds ahead of Roeser in third. Fischer would ultimately finish fourth in 1:09:13. Taking home the prize money in the master’s division were local favorite Shannon Teslow (1:36:00 (55 years young)) and Colorado Springs’ Andy Rinne (1:22:51). Age group award winners took home beautiful pottery awards from famed local potter Amy Hayman. 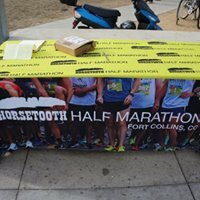 For those that weren’t able to collect their awards at the post-race prize giving, they are available for pickup for the next few weeks at Altitude Running. In addition to our award winners, all finishers went home with a beautiful commemorative pint glass from New Belgium Brewing and a unique, handmade finisher’s medal also made by Amy Hayman. In closing, we’d like to thank all of our wonderful volunteers that helped out in many different capacities to help make the 2019 running of the race a success. Thank You! We’d also like to thank our seven wonderful top-tier sponsors who have supported this year’s event with total enthusiasm. 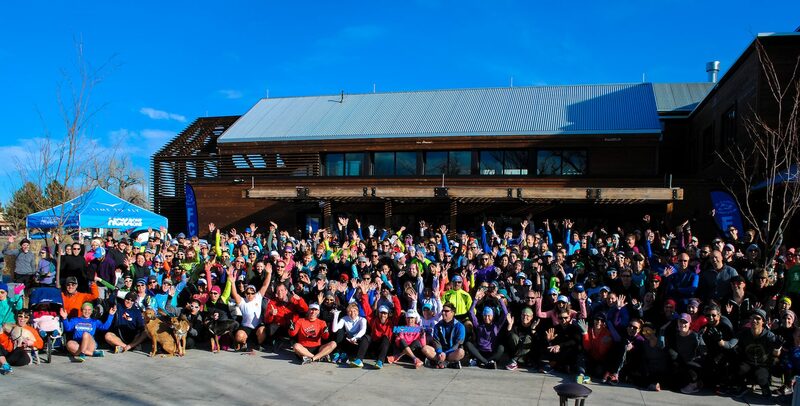 Thanks to all who joined us for the kick-off to the 2019 RunningU Horsetooth Half Marathon training program! 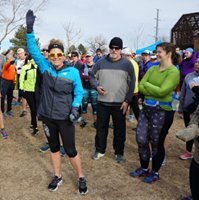 Runners enjoyed a 4-6 mile run on the Poudre Trail with 200+ of their closest friends, followed by New Belgium drink specials, snacks, sponsor giveaways and a training presentation from our friends at Colorado In Motion. See below for a series of 5 suggested strengthening exercises from Colorado in Motion designed specifically for endurance runners. 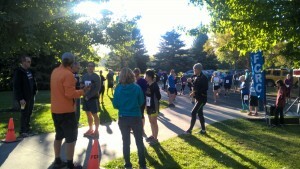 Group runs happen each Sunday, with much more information, runs, newsletters & more available for RunningU participants. See the full training schedule. Some of the action at New Belgium snapped by Terry Grenwlege before and after the kick-off training run. View the full photo album from the morning’s run. 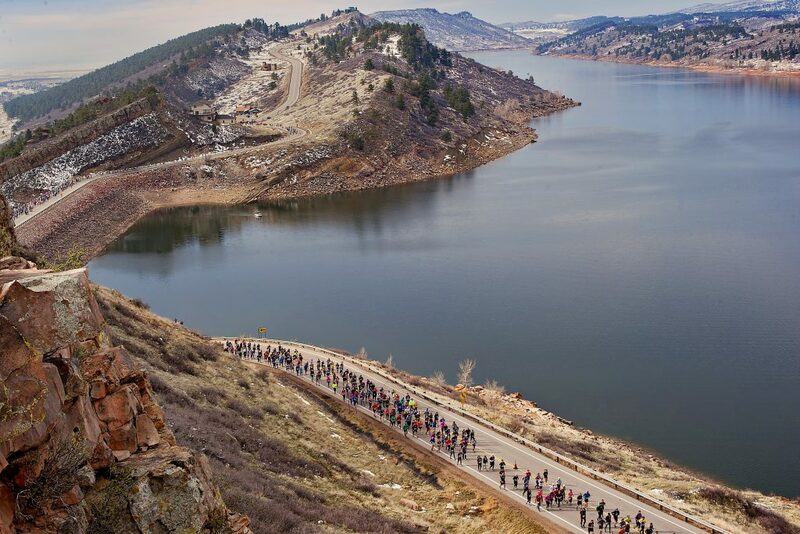 We kicked off the Horsetooth Half Training Season in grand style on Sunday, January 7 with a mega-group run from New Belgium Brewing. 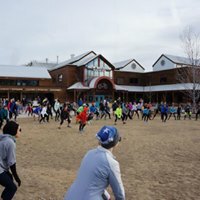 We want to extend a few words of thanks to our hosts New Belgium for their continued support of the race as we enter our 45th year, and also to the Fort Collins Running Club for coming through with post-race snacks and also for their help in organizing the RunningU training program. The run was followed by a great presentation from Terry Gebhardt at Colorado in Motion. Terry demonstrated some key strengthening exercises that endurance athletes can use to keep themselves healthy and on track as they increase their mileage in preparation for race day. Contact Colorado in Motion if you’d like to learn more about their ‘Run Stronger’ program designed specifically for runners. 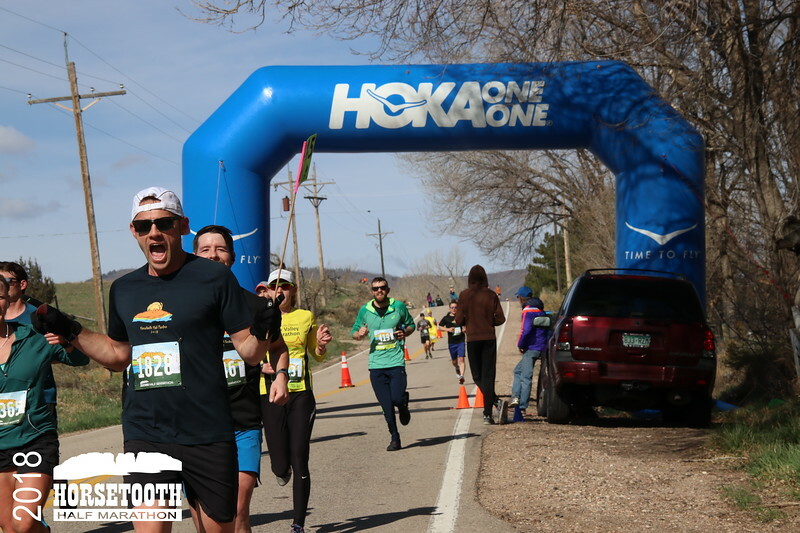 We were also excited to have Hoka One One on hand with demo shoes, and welcome them as our newest race partner. 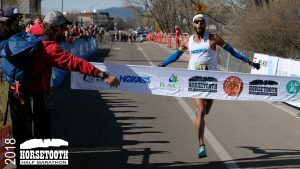 Both Hoka and Colorado in Motion will be on hand at future training runs to offer advice on training and shoe choice as you get ready for race day on April 15. We will be offering group runs and activities every Sunday leading up to the race. Please check out the Training Page for more information. 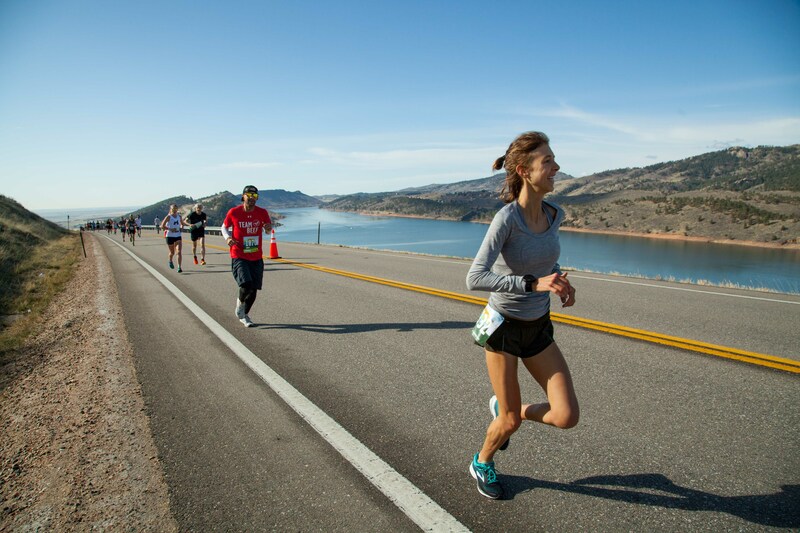 Early bird pricing for the 44th running of the Horsetooth Half Marathon will expire January 6 at midnight. We’re expecting record numbers in 2017 and will cap at 2,500 registrations. If you plan on running the race this year, register soon and save. On race day, we’ll have medals and commemorative pint glasses for all finishers. 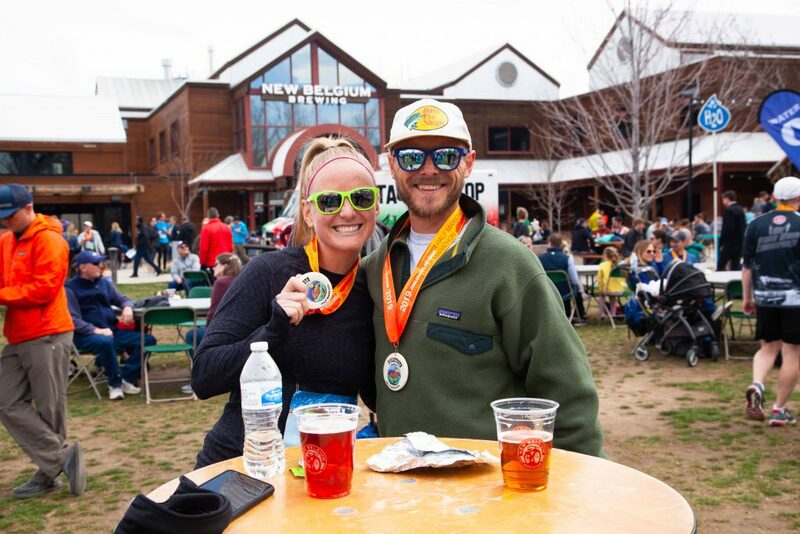 And of course, once you’re done we’ll celebrate together at the legendary New Belgium Finish Line Party with free beer, free food and raucous live music, this year on the brewery’s newly expanded patio. 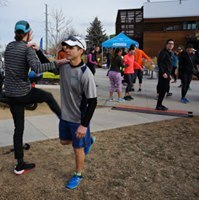 If you need a little motivation to get that training kick-started, then check out the race Training page for a customized schedule or to learn about the weekly group training runs through the FREE Fort Collins Running Club RunningU program. 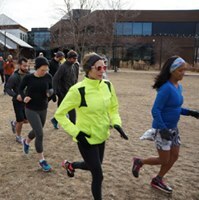 We’ll be kicking off the training season on January 15 with runs of 4 or 6 miles on the Poudre Bike path, beginning and ending at New Belgium. After the run enjoy drink specials (beer-mosas, anyone? ), a training presentation from Colorado in Motion and a chance to try on the all new Salomon road line. Group runs will be held each Sunday at 8am (Maxwell) or 10am (NBB) depending on location. 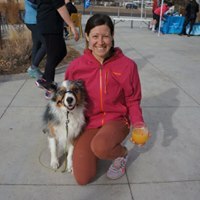 Sunday runs are free and open to all. 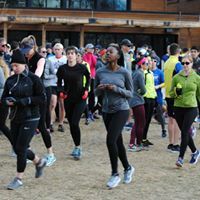 Fort Collins Running Club members also enjoy weekly motivational emails, mentoring, communication with other members and free entry to the Tortoise and Hare Race Series. 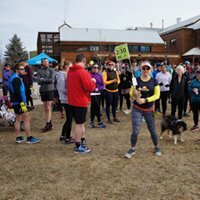 Join the Fort Collins Running Club this Sunday (Jan 8) for the fourth Tortoise and Hare of the 2016/17 season, an 8k (5 miles) from Edora Park. The T&H races are a low-key “handicap” series of seven races, run monthly from October to April. Computer-predicted handicaps allow runners of all levels to compete equally. 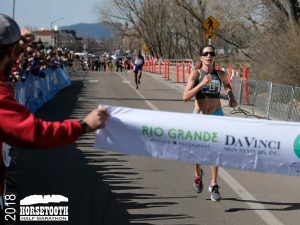 Participants are scored across the series and the top five are awarded checks to one of Fort Collins’ two specialty run stores: Altitude Running or Runners Roost. The series is free to all Running Club members or $10 to non-members. Join us afterwards at Raintree Athletic Club for bagels and coffee. All participants for this Sunday’s race must register by noon on Saturday. Snow on the ground means being light on your feet. 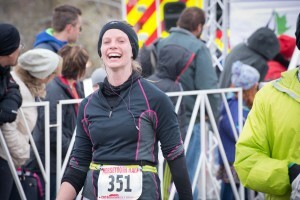 This is a great time to focus on becoming an agile runner. This month lets focus on strengthening your core and leg muscles while improving your quickness and endurance. The 4 square hop drill should be done on a flat surface. If you are new to these type of exercises, be sure to focus on good form and progress slowly to avoid injury. 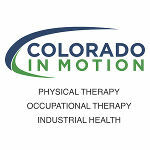 If you are looking for a more comprehensive winter training program, contact Dr. Terry Gebhardt at Colorado In Motion at Terry@ColoradoInMotion.com.